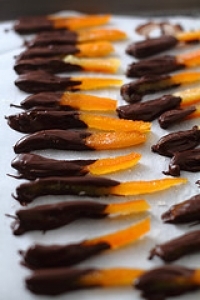 Have you made Candied Citrus Peel? 1. Score peel into quarters. 2. 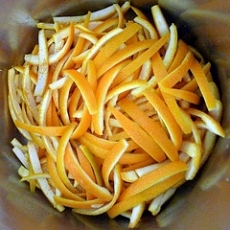 Remove sections of peel with fingers; cut into uniform strips about 3/8 in. 3. wide. 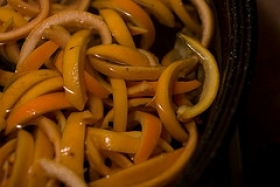 Boil peel with 6 cups cold water, uncovered, for 10 minutes. 4. Drain and rinse. Repeat process with 6 cups fresh water. 5. 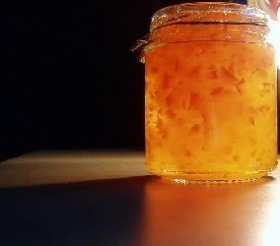 In a large saucepan, combine 1 1/2 cups sugar, honey and boiling water. 6. Bring to a boil, and boil about one minute. 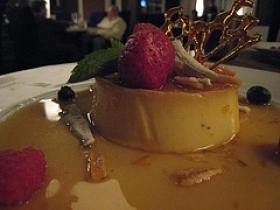 Add cooked, drained peel and briskly simmer until almost all of the syrup has been absorbed, about 30 to 40 minutes. 7. Stir frequently to avoid sticking. Transfer peel to colander. 8. Drain well, about 10 minutes. 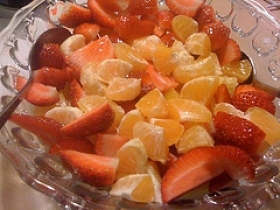 In large bowl, toss drained peel with remaining 1 cup sugar to coat well. 9. Spread pieces out on waxed paper to dry. Store in tightly covered container. This recipe is a good source of Vitamin A with 12% of your daily recommended intake per serving. 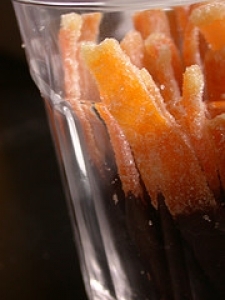 This recipe is high in Vitamin C with 288% of your daily recommended intake per serving. 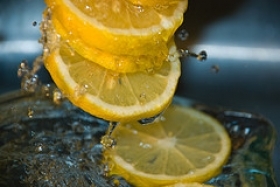 This recipe contains potential food allergens and will effect people with Lemon, Natural Sweeteners, Fructose Malabsorption, Oranges, Citric Acid allergies.